It was not long ago that Serenwilde was visited by the half-formed named Xarriv the Reaver, who had followed the memories of Charune, Lord of the Hunt across the Void and into the First World, wreaking havoc, and then was banished back to the Void by the Horned One Himself. And yet, mortal memory is short, and life is full of its daily troubles; many distressing events had occurred in northern forest in the short time since the banishing of Xarriv. It was no surprise, then, that questions on Xarriv’s origins and whereabouts were cast aside while Serens attempted to rebuild their forest once more. Yet in Avechary of the year 473, members of the Order of Lady Maylea began receiving disturbing visions and sensations of pain, causing them to fear for the safety of their Goddess. Their fears seemed realised when the next month, they felt their connection to Maylea sever almost completely, to their fear and dismay. The members of Maylea’s Order decided to seek out help froms Gods and mortals. Two prophecies emerged from these inquiries. 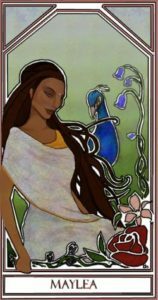 The first, spoken by Charune’s priest Sife and heard by Aeldra Ladyn, said: “Turmoil comes in petal’s shade, blue tinged red in wishes made. Guard your hopes from prying eyes, watch dream’s truth ‘mongst whispered lies. Serenity heralded in voices five, what is old dies amongst change so ‘live.” The second, spoken by the spirit Chuchip and heard by Saz Strongleaf, said: “Stronger than distance is sibling bond. Harsher than wounds is mind gone wrong. Broken is Ancient; change has come. Nurture to fruit your Hope, your Song.” Tokota Snowmane, centaur augur of Serenwilde, also found something amiss, working with astrologers Gwirodydd and Fayette to find that the signs of Twin Crystals, Spider, and Glacier were particularly bright during those months. These prophecies and portents, while informative, generated disparate theories among those who heard it, though everyone feared that some terrible occurrence was approaching. Unbeknownst to Her mortal followers, the visions, sensations, prophecies, and portents were all related to the experiences to the One whom they worshipped. Some time ago, the Elder Goddess Maylea had set out into the Void to seek out Xarriv the Reaver, hoping to soothe him of his crazed insanity in the Void and keep him away from Lusternia, perhaps even to find him a place of his own to dwell. Her seeking was not entirely unfruitful: She met another half-formed named Mamaac the Melder on the edge of the Void near Lusternia. The creature had traversed the cold, harsh Void with the sole purpose of avenging her crechemate Xarriv, whose pain in the battle with Charune had psionically echoed to Mamaac across the gulf of distance. Upon seeing Maylea and sensing the divinus within Her, the crazed half-formed attacked the Goddess viciously, forcing Maylea to strike back and defend Herself. The suddenness of the attack overwhelmed Maylea, and She was gravely injured by the lithe and vicious creature. Mamaac the Melder then glowered in victory, opening a rift into the First World to seek her revenge against her brother’s attackers – but not before Maylea draped Herself upon the half-formed, weighing her down. Mamaac the Melder emerged in Lusternia with the appearance of a long, thin, blazing creature of silver body and smoky blue wings. But with Maylea’s golden unconscious presence anchored to her still, the half-formed could not keep herself aloft, and she crashed into the Serenwilde, both her and Maylea’s essence dissipating into the forest. Soon enough, white and blue fire began kindling and raging across the Serenwilde, and unwitting forest dwellers fell victim to groups of silver spikes from the soil that put their targets to sleep. In sleep, Serens experienced dreams limned in a bright, harsh shimmer. The dreams gave wild visions of a pink sky above a rocky terrain, strange experiences of falling to slow insanity in the Void, strong sensations of sorrow and need for vengeance, and memories of nostalgia and sadness that came with destruction of one’s home. As if fires and forced sleep were not enough, those who were in Serenwilde soon found that they were being possessed by a mysterious presence. The first possessed was Orimi of the Listeners, whom the presence attempted to make fly, even though she was human. Other possessions came in quick succession: young and old, members of any race, even old Abeytu, Keeper of the Gardens in the Serenwilde, who sprouted mysterious blue wings and flew up, only to be released in mid-flight to land, cushioned, on top of Aramel Shevat. The presence attempted to speak to and speak through all those it possessed, sometimes even using the victim to attack others through punches and kicks – ineffectual, but disturbing to witnesses. Upon learning that Xarriv had indeed come to Serenwilde and was banished (some said killed) by Charune and the Serens, the presence went into a rage, threatening revenge and boasting that it will slay all those in Serenwilde. And the presence seemed determined to make good on that promise. Gradually, Serens began to experience psionic assaults upon their mind as they walked through their home forest. The assaults were strong and unforgiving, destroying the minds of even the toughest demigods and ascendants. Flames of white and blue flared among the trees, hills, and even waters of Serenwilde. And, after the blazing-eyed possession of the leprechaun Goldie Cloverleaf, silver limbs began shooting out of the ground and grabbing and burning the passersby. All throughout, possessions continued, sometimes punctuated by aggressive commentary inside the victims’ minds by a shrill humming voice. Before long, those of Serenwilde had begun to take refuge in their safest havens. And yet, no single place was found to be safe from the mind assaults and burning spikes of the murderous presence. In the midst of their worry about the invader, Serens began to notice a lovely fragrance wafting across the forest. At first, they mistakenly thought that a bloom associated with the Mother Moonhart was the source of the fragrance, but glowing lights above Southern Moon Lake led them to a shimmering water lily they had never seen before. It soon became apparent that the water lily required nurturing. Silvery essences and sacred items of each of Serenwilde’s guilds were offered to the flower, at times requiring half-remembered rituals and the summoning of ancient spirits to obtain the needed offerings. Aramel Shevat and Lehki Talnara represented the Sowers in the efforts; Valaria Strongleaf and Kalas Aesyra represented the Wodewoses; the Listeners were represented by many eager hands, but Saran Strongleaf persisted, and he placed the final offering to the water lily, which flew up into the sky, spinning with golden light, and then died on the southern bank of Moon Lake. As Serens searched the area in wonder, the remnants of the bloom fell into the forest soil and sprouted into a peach of golden hues that continually hummed a battle song without words. The forestals came together as one to care for the peach, which they believed to be their salvation against the ever more abrasive presence that continued to possess and harass Serens. The fruit’s caretakers brought rich, dark soil for its roots, hundreds of corpses for fertilizer, a smattering of sweet honeycombs from the Ethereal Plane, and even more silvery essence. As the peach grew, fae began dancing around the humming peach, in particular one brownie, who continually called the fruit “ayl’kiun”, to the confusion of its caretakers. As the singing, golden peach grew larger and larger, its song began to sound across the forest, until finally, the fruit split with a loud CRACK, spilling fragrant nectar upon the ground. The shrill, harsh voice of the presence screamed in anger at this occurrence, and suddenly, the unnaturally stretched, silver-blue form of Mamaac the Melder emerged from the canopy of the Serenwilde: the half-formed was whole again, and it seemed that she was that possessing presence all along. Mamaac was met by a wary group of Serens, some of whom sought to know her purpose, and others, guessing her thirst for vengeance, simply asked her to leave. One foolhardy Wodewose, Athemal, provoked Mamaac to anger and almost paid with his life. But Mamaac had a broader base for her vengeance than one forestal. She flew up over the Serenwilde, sending sparks of white flame over the trees and setting the forest on fire, readying herself for the commune’s total destruction. It was at this moment that the singing, golden peach cracked again, the sound resounding across the forest. Witnessed by a good portion of the Serenwilde, the peach opened with blazing light, and out from it stepped none other than Lady Maylea, transformed. She called Herself “Ayl’kiun” in the tongue of the fae, Sword of Serenity. Without waiting, She leaped up into the skies above the Basin of Life, blossoms of many colours swirling about Her; She was soon met by the half-formed. And so Mamaac and Maylea did battle: The half-formed was all sharpness and angles – stabbing, dashing, blazing and burning with neck and limbs unnaturally long, like an insect. Maylea, now in the aspect of Sword of Serenity, fought Mamaac with flowing movements, bending and twisting, blossoms swirling, Her hands all aglow. When it at last that Maylea had finally cornered Mamaac, the half-formed used desperate strength to stab a blazing, silver limb into the Goddess’s left eye. In agony and bleeding golden essence, Maylea cried out and threw Mamaac the Melder back out into the Void. Having defended Her beloved forest, Maylea, Bloom of Serenity quickly retreated to the Havens, still bleeding, fading from mortal detection.